If you’re not getting what you need from the pregnancy books, why not try something a little different? Instead of reading, use your listening skills. Podcasts are everywhere, and there are entire series devoted to pregnancy. They’re perfect for putting on when you’re chilling out at home, doing housework, driving or commuting to work. And whatever your pregnancy expectations, fears and questions are, there really is something for everyone. Hosted by Adriana Lozada, Birthful is packed with pregnancy tips tried and tested by moms and backed by birth and postpartum experts. The information is well-researched and based on evidence to put your mind at ease and help you make the right choices for you and your baby. Pregnancy Podcast is a great place to start if you’re looking for specific advice on a pregnancy or birth topic. Host Vanessa Merten shares the pros and cons of every pregnancy/parenting decision, calling on expert guests to provide different perspectives and using the latest research to help you figure out your best options on prenatal care, labor, breastfeeding and all aspects of newborn care. If you’re the type of person who likes to know all the facts, 40 Weeks Pregnancy Podcast, from Vanessa Merten of Pregnancy Podcast (above), will tell you what’s going on with your baby and your body at every stage of pregnancy. From finding out how big your baby is and how your body is adapting to pregnancy to remedies for morning sickness and how to put together your birth plan, this podcast delivers it all, week by week. You can sign up to get each week delivered right to your inbox according to your due date. 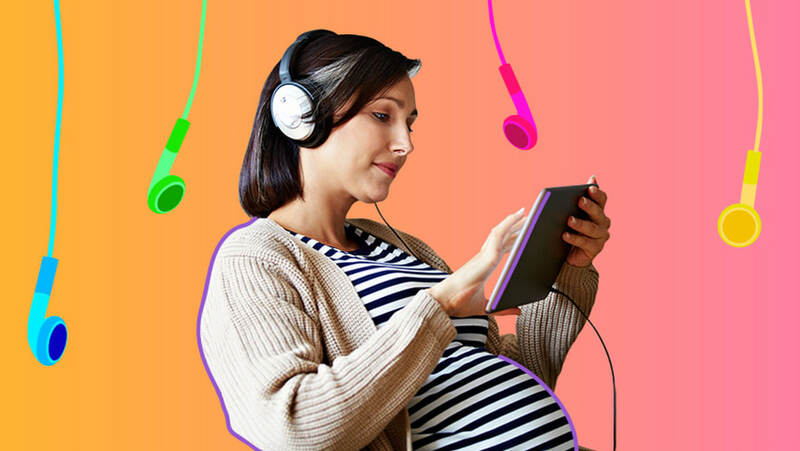 Hosted by editors from Parents and Fit Pregnancy and Baby magazines, Pregnancy Confidential consists of 32 podcasts designed to be listened to in sequence during pregnancy. Each podcast is only 10 to 20 minutes long, so it can easily be slotted into your day no matter how busy you are (and you probably won’t have to take a bathroom break). You don’t get medical information about pregnancy here — what you do get is a friendly, conversational tone breaking down all the physical, emotional and lifestyle issues related to each week of pregnancy. As the name suggests, Preggie Pals comes from real pregnant women who are at various stages of pregnancy and have different attitudes toward pregnancy and childbirth choices. The panel regularly consults experts to provide different viewpoints and help listeners embrace pregnancy and have the confidence to make decisions they feel comfortable with. Baby in Bloom is perfect for first-time moms-to-be, with host Linda Lia sharing tips and advice to help listeners separate the facts from the myths on everything from morning sickness and vaginal discharge during pregnancy to prenatal care concerns and planning a baby shower. Not all moms have the same backstory, and for the last six years Sophie Harper, a single mother (by choice) to Astrid, has been sharing her own personal parenting journey. Not by Accident is worth listening to whether you’re a married mom, a single mom, not yet a mom or simply love good storytelling. Doctors, midwives, doulas and parenting authors join forces with moms-to-be on Pea in the Podcast to talk about a wide range of pregnancy topics. Host, writer and producer is multi-award-winning journalist and mom Bonnie Petrie, who uses humor and honesty to guide moms through pregnancy, week by week.